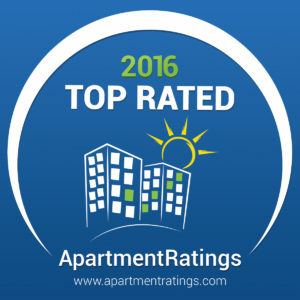 Buckingham Companies is proud to announce that almost half of its portfolio is recognized with the Top Rated Award from ApartmentRatings in 2016. For many of the communities, this is their third or more year winning this award. Thanks to each of the community’s residents, they were able to earn this recognition from positive and honest feedback provided by residents on each community’s profile through ApartmentRatings. Barrington Estates Apartments is located on the northwest side of Indianapolis. Residents enjoy residing within walking distance to restaurants including Applebee's, The Original Pancake House and Boston Market. Barrington Estates offers large apartment floor plans in both garden style and townhome designs. The spacious one, two, and three-bedroom floor plans feature private patio/balcony areas, fully equipped kitchens, generous closet space, and oversized bedrooms. Renovated amenities include a large swimming pool and sundeck with new furniture, a refurbished fitness center, on-site laundry room, and business center.